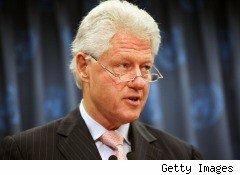 Former President Bill Clinton, 63, who had two stents put into a native coronary artery in his heart on Thursday, was undergoing what's become a common proceudre to clear plaque buildup after surgical grafts inserted during bypass surgery have become blocked. Clinton underwent a quadruple bypass in 2004 to free four blocked arteries, and the graft had narrowed.Stents -- marketed by such major players as Boston Scientific (BSX), Medtronic (MDT), Johnson & Johnson (JNJ) and Abbott (ABT) -- are wire metal mesh tubes used to prop open an artery. The stent is collapsed to a small diameter and placed over a balloon catheter. During a procedure called an angioplasty, doctors make a small incision, usually in the patient's groin, and insert a catheter all the way to the blocked artery. Once cleared, the balloon is inflated, and the stent expands and locks in place to form a scaffold that keeps the artery open. The stent stays in the artery permanently to improve bloodflow to the heart muscle and relieve symptoms of heart conditions, such as chest pain. Within weeks, the inside lining of the artery grows over the metal surface of the stent. The placement of the stent reduces the risk of the artery's narrowing again, but doesn't prevent it entirely. Although bypass surgery is necessary when balloon angioplasty or stenting does not solve the problem, more than 70% of coronary angioplasty procedures include stenting. (One study suggests that this figure indicates an overuse of stents.) Some stents are coated with drugs that are released gradually to keep the blood vessel from reclosing. The procedure is not without risk: Patients can develop an allergic reaction to stent material or drug, a blood clot, or a rupture of the vessel during the procedure. We don't yet know whether Clinton will need to repeat this procedure. But doctors advise heart patients to stay on heart medication, and to control other risk factors -- which mostly means following a healthy lifestyle.